We’d almost reached King Henry’s soccer pitch when it happened. The air heated up and the ground shook. Woah! What the hell was going on? Was it an earthquake? My mum and dad laughed as we involuntarily ‘danced’ on the grass. I looked skywards to see the Vulcan bomber’s engines pointing directly at us. 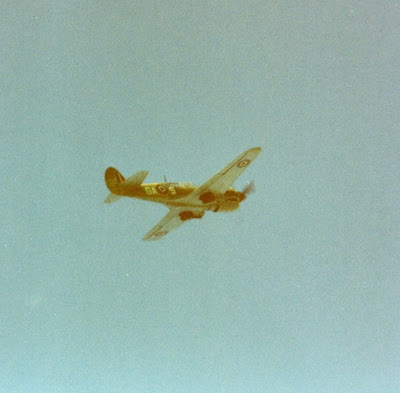 It had gone into a steep vertical climb and although we were obviously a safe distance away on the ground the thrust of its Olympus engines was enough to give me my most memorable moment of that or any other Air Day. Picture courtesy of Rob Orland. The Coventry Air Show - or Air Day as it was commonly known - has now sadly passed into the history books. It was one of the highlights of the year when I was a child growing up in the 1970’s and early 1980’s. I’ve already touched on how lucky I was to live on Stonehouse Estate during my younger days in the ‘Wasteground’ blog. Another benefit was the proximity to Coventry Airport. Every summer we had Air Day to look forward to. For a kid who was very much into military things it was the bee’s knees. To tide us over until the big day, some of Britain’s earliest jet aircraft - The Meteor and Vampire - would often take off from Baginton on Sundays and fly over the surrounding area. My brush with a Vulcan bomber may be my most memorable moment but there were many highlights. I think I preferred the roar of a jet engine when I was a kid so the Red Arrows always scored highly with their precision aerobatics and red, white and blue smoke trails. Who can ever forget when Concorde paid a visit? From our vantage point on the playing fields off Sebastian Close we could see the traffic on the A45 come to a standstill as drivers and passengers got out of their vehicles to watch this beautiful aircraft fly over them. And the Harrier jump jet? What a marvel of British engineering! Vertical take off, flying backwards and having a jig in the sky? Amazing!!! The Starfighter belonging to the Royal Canadian Air Force was another favourite of mine. It would fly in a day or two before the show. On hearing the racket caused by its engine I’d rush to the field to watch it land. A parachute was deployed to help slow it down once it touched the tarmac at Baginton. It was always a relief to see the parachute as I used to worry about the plane coming off the end of the runway and blowing up! 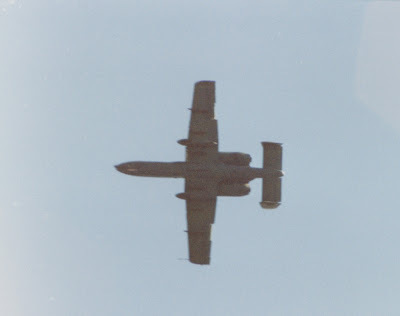 Another ‘magic moment’ was the appearance of the A-10 Thunderbolt. This odd looking aircraft with its huge externally mounted engines was designed specifically to take out tanks with its nose mounted Gatling gun and missiles. Sadly, since the days of the air show, British soldiers have been on the receiving end of so-called “Friendly Fire” from this fearsome beast which is also known as “The Tankbuster” and “Warthog”. Fusilier Lee Thompson from Coventry, aged just 19, was one of nine soldiers killed during the first Gulf War when Maverick missiles fired by two A-10’s hit their Warrior vehicles. It should never have happened and when I think back to the A-10 flying over Coventry I now always also think of Lee Thompson and the other soldiers whose lives were cut short unnecessarily. The Lightning was another great one to watch. I loved its shape and ‘stacked’ twin engine arrangement. I think the fact that it flew at Mach 2 way back in 1958 had something to do with it also! Jets may have been my favourite but they were always run close by the Battle of Britain Memorial flight comprising of a Lancaster bomber, Spitfire and Hurricane. The ‘Lanc’ is my favourite bomber from WWII. As a child I always imagined being in the tail gun turret and fending off Messerschmitt’s as we bombed Germany. Like the Spitfire, The Lancaster is powered by the distinctive Rolls Royce Merlin engines. When you hear the sound of a Merlin you never forget it and in the days leading up to the show that noise in the sky could only mean the Lanc, the Spit or both would come into view at any moment. Seeing “Sally B” - the famous B-17 Flying Fortress - was also memorable. It still is my favourite American bomber of all time. I only remember actually going inside the airport once on Air Day. My overriding memory is of military memorabilia stalls selling stuff from World War II - Nazi pendants and medals come to mind. Another time we walked up to the airport perimeter fence on Rowley Road to watch. It was from this vantage point that we saw a P-38 Lightning (American twin propeller aircraft from WWII not to be confused with the British jet aircraft mentioned earlier) almost collide with a windsock! There was a sharp intake of breath from everyone who witnessed it. During my time of watching the air show I think it was organised by the Royal Air Forces Association. They pulled the plug sometime in the 1980’s and moved it to RAF Cosford which they considered to be a better location and more suitable for jet aircraft which often couldn’t land at Baginton. There have been “Air Shows” at the airport since then but nothing has really come close to what I remember from my childhood. Most have been largely propeller based and tragically there have been fatal crashes. All is not lost though. The excellent Midland Air Museum on Rowley Road has a great collection of aircraft - including many of my favourites from Air Day! It also tells the story of Coventry’s many links to the aviation industry inside its “Sir Frank Whittle Jet Heritage Centre”. Maybe with the demise of Thomsonfly flights from Baginton we’ll get another Air Day soon? Here’s hoping! Thanks to Rob for allowing me to use his pics from the 1988 show.